I have talked about my Aunt Marg before. She’s a legend in our family for winning a washer and dryer in a baking contest with her Hickory Nut Cake. You can read about it here. 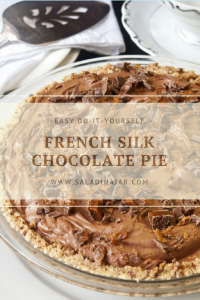 Then there’s her Fresh Peach Pie and now this recipe for French Silk Chocolate Pie which shows up frequently at our Thanksgiving and/or Christmas celebrations. 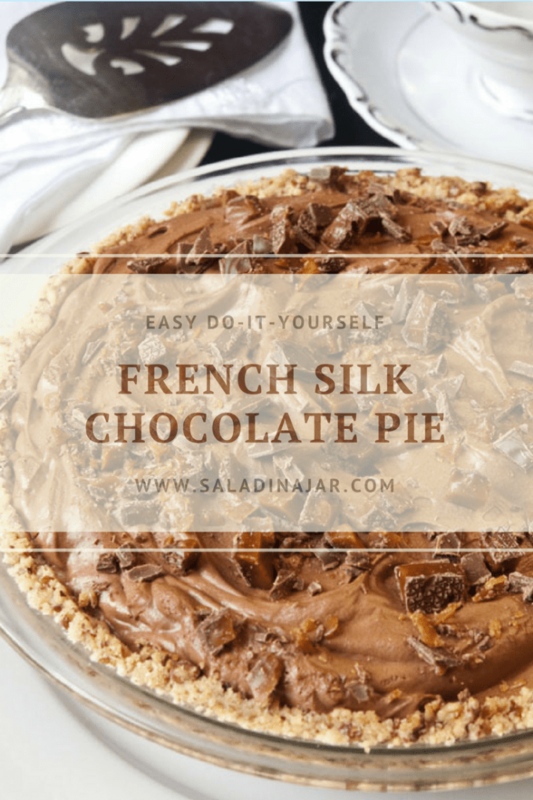 What makes Aunt Marg’s French Silk Chocolate Pie extra special? Contrast those two crunchy textures with the exquisitely smooth chocolate filling. It’s like jumping into a cool swimming pool on a hot Texas day after mowing the yard. The pleasure is almost unbearable! If you are squeamish about eating uncooked eggs, look away. It’s how our family does this pie and since I’m recording this for a family cookbook, it has to be done. This is not a good pie to make on a hot day. It will soften quickly if not kept chilled. 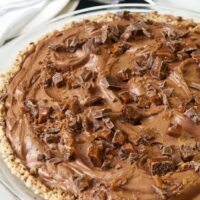 Silky smooth chocolate pie with a crumbly pecan crust and topped with chopped chocolate covered toffee candy bars. Place flour and butter in food processor. Pulse until crumbly like oatmeal. Add pecans and pulse till all pieces are slightly smaller than oatmeal. Press into 7-1/2 or 8-inch pie plate. Bake at 400 degrees for 12-13 minutes. Cool. In stand mixer, whip butter until light and smooth for 1-2 minutes. Add sugar and continue to whip for 2 minutes. Add chocolate and beat another minute. Add one egg. Mix for 2 minutes on medium. Add second egg and beat for 3-5 minutes or however long it takes to dissolve the sugar completely. Taste it and see if you feel any graininess on your tongue. If so, keep mixing. Undissolved sugar will make you think you are eating a sand pie which kinda puts a damper on the whole experience. Spoon filling into cooled crust and refrigerate until firm. Sprinkle with chopped Heath or Skor Bars. Whipped cream wouldn't be bad either. I first has French Silk Pie back in the 70s. I don’t know where my mother found the recipe–probably in one of her women’s magazines. Maybe even the Hershey’s Cocoa powder box. Then it disappeared. She had it written on an index card, but when I tried to make it for my husband as a newlywed, it was a spectacular failure. (NO ONE ever suggested a crust like this one, though, and I feel like someone’s been holding out on me all these years.) I am looking forward to making this for my family, although the husband and I have reached the age where we can’t really eat these things anymore…. Oh well. One piece won’t kill either of us, will it? Thanks for posting this, even though I am years late in finding it. Oh yes! Margarine would be yuck. Never heard of using cream of tartar though. It is already smooth as velvet but maybe worth a try. I’ve made a chocolate silk pie, for 20 years or more, using just margarine. (then the 2 raw eggs, sugar, vanilla) For some reason, in the last few years, the pie is watery and grainy. I’ve used all brands of margarine, cold eggs, room temp. eggs, longer beating times, etc. etc….. Do you know why the pie doesn’t set up like it use to? Marilee, I’ve never made it with margarine. Using real butter is just too fabulous. Have you switched brands? Are you using diet margarine? It definitely has more water in it. I’ll pose the question to my readers on Facebook this week. Maybe somebody will have an idea. Wow!!! That looks AMAZING, thanks for the recipe! I plan on making it for Christmas Eve. I do have one question though. When you listed the unsweetened chocolate in the ingredients, you stated that it needs to be melted and cooled. How cool does it need to be? Obviously not solid again, but not hot off the double boiler or microwave. The pie was a HUGE hit for T-day. With our crowd of 60 and about 30 pies/desserts, no kidding, this was the first pie gone. It got big raves by those lucky ones who got some. My son had a slice and didn’t eat it all, so I tasted his. Divine! 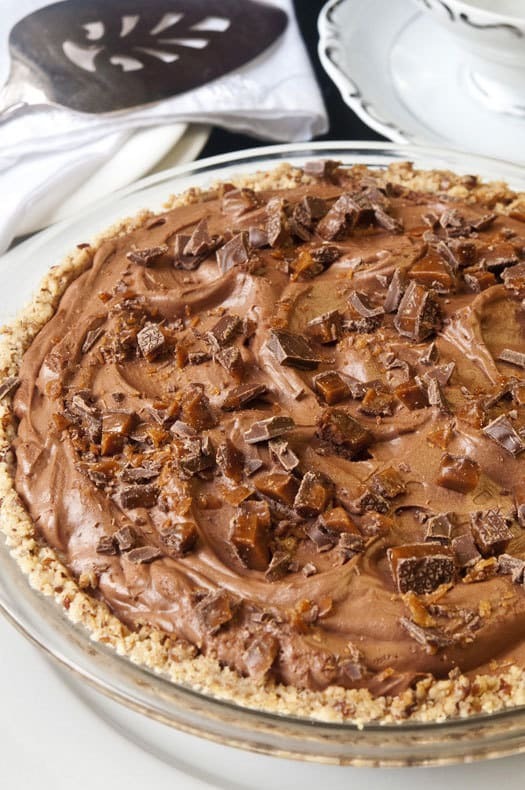 Another wonderful pie recipe! And I love toffee – made a toffee cream cheesecake the other day – with crushed bars. A holiday to-make list, for sure. And I really like nut crusts too – they give it so much texture and flavor! Looks wonderful – thanks Aunt Marg! Thanks for a great recipe. Raw eggs is not really an issue with me, so this would be perfect for the holidays. Yowza! Coming soon to a table near me! Looks like Aunt Marg hit a homerun with this one!! Gorgeous!! 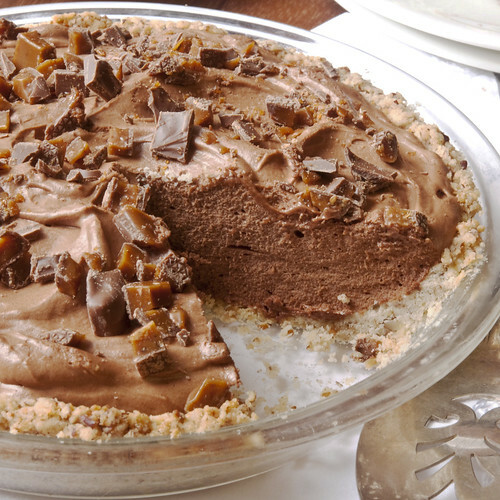 I love French silk pie and love that it is paired with a crushed pecan crust! I think Aunt Marg knows a thing or two about pie! I’m sure my family would love your pie. This looks delicious and the crumbly pecan crust is something I know I would love. omg. this looks absolutely divine, Paula! Now, that’s heaven on a plate! Thanks for the recipe. That looks great. I had a French Silk Pie throwdown with some friends a few months back. I learned a “trick” with the pie I made, use superfine sugar, which dissolved better (still recommend the times you have for beating the ingredients). For the throwdown, I tried many different recipes, but liked the one I used superfine sugar for better. I also tried some with different amounts of chocolate and 2 ounces won. And now I want to try your Aunt’s recipe. Maybe I will for Thanksgiving. I’m always bored by just all the pumpkin pie. 😉 Love the toffee on top, too! I knew you would like the toffee, Katrina. The idea of using superfine sugar makes sense. I supposed you could put regular granulated sugar in a blender to accomplish pretty much the same thing. I agree, I know you can make superfine sugar by putting it in a blender or food processor. I AM making this. I’m about to premake the crust. Oh, Paula, I have learned that any recipe featured on your blog is a good one and this looks delicious! Oh my gosh, I really wish I had a piece of that in front of me right now. I have a recipe from my grandma with raw eggs. I ate it countless times growing up and never had a problem, but I was thinking about buying pasteurized eggs the next time I make it.